The Academy Of American Poets recently announced their mobile poetry website, complete with numerous poems arranged by theme or occasion and by form. 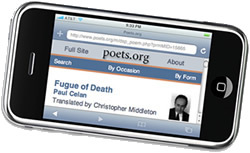 Now, if anyone accuses you of being shallow, you can call up Paul Celan's "Fugue of Death" on your iPhone, recite a few lines, and quickly prove them wrong. Categories: Community, Humor, and Poetry. Tags: Academy Of American Poets, IPhone, and Mobile Web. Poets: Paul Celan.